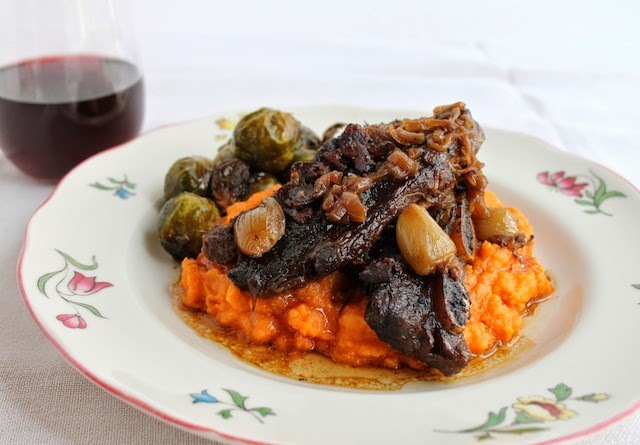 Beef slow braised in red wine is a classic dish needing just a little hands-on work and then a lot of hands-free oven time, resulting in meat that falls off the bones and gravy that you’ll want to slurp up with a spoon. This week my Sunday Supper family, along with our host, the fabulous Alice from Hip Foodie Mom, is bringing you recipes that require five ingredients or less. The powers that be decided that water, oil, salt and pepper would be “freebies” and don’t need to be included in our count, thank goodness! I decided to adapt a recipe for beef Bourguignon that normally has way more ingredients because I thought it would still be possible to make something rich and flavorful if I chose my ingredients with care and thought. Each item had to add to the flavor spectrum and bring multiple hues to the finished dish. The beef must contain bones and a goodly helping of fatty meat to add rich beefiness so I chose short ribs over a leaner cut. The red wine would contribute tang and depth as well as help to tenderize the meat as it cooks. The bacon would be honey- or brown sugar-smoked, adding sweetness and smokiness to counterbalance the acidity of the wine. The wild mushrooms would add an earthy undertone to the finished dish which often includes fresh mushrooms. 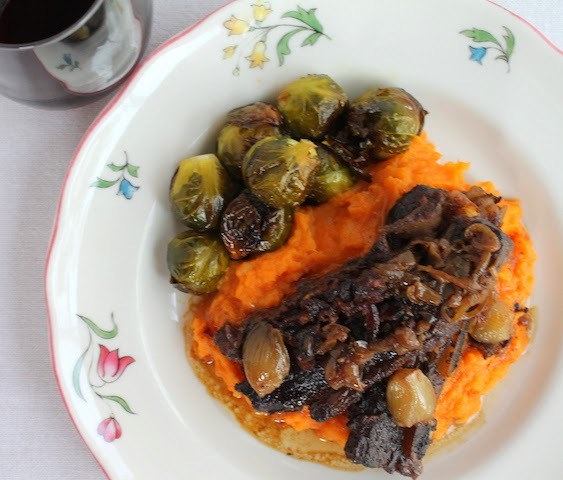 And finally, the shallots would bring sweetness and body to the broth and the braising beef ribs. Using shallots instead of normal onions also allowed me to set aside the smallest ones to add in near the end of the cooking time to mimic the pearl onions that are often included in traditional Bourguignon recipes. I would have dearly loved to add a sprinkle of chopped parsley right at the end, but that would be breaking the rules, and I must admit, I didn’t really miss it for flavor. The color just would have been pretty. Sea salt – I use Maldon’s flakey salt. Season the short ribs on all sides with a good sprinkling of sea salt and freshly ground black pepper. Cover with cling film and set aside. Meanwhile, start prepping the rest of your items. Put your dried mushrooms in a heatproof bowl and cover them with about a cup or 240ml boiling water. Set aside to soak. Peel and slice your shallots very finely, setting aside all the little bitty ones and leaving them whole. All the bottom ones were sliced, The little ones up top were saved for the last hour of cooking time. Slice the bacon into small strips and panfry them until they are crispy, stirring often to make sure the pieces don’t burn. Remove the bacon with a slotted spoon and put in on a saucer. Use the bacon grease to fry the short ribs, a few at a time, until they are browned and golden on both sides. Don’t crowd the pan or they’ll just steam instead of browning. When all the meat is browned, pile the sliced shallots into the pan and cover it with a tightly fitting lid. Preheat your oven to 275°F or 130°C. Cook the shallots over a medium heat, lifting the cover and stirring occasionally to loosen all the lovely sticky bits off the bottom and sides of the pan. Meanwhile, scoop the mushrooms out of their soaking water with a slotted spoon and chopping them up a little if the pieces are bigger than bite-sized. Pour the mushroom water through a very fine mesh sieve, being careful to stop just before you get to the sediment at the bottom. When the shallots are soft, add in the red wine and cook down until about half the liquid has evaporated away. Now add the mushrooms and the strained mushroom soaking water. Stir well. Nestle the ribs in the shallot-y, mushroom-y broth and top with the crispy bacon, making sure to add any juice that accumulated in the bottom of the rib or bacon plates. We can’t let any of that goodness go to waste. Cover the meat with a piece of heavy-duty foil and then put on the cover. Slow roast in your preheated oven and set a timer for two hours. After two hours, take the pan out of the oven and tuck the reserved small shallots in the juice around the ribs. Put the foil back on and replace the lid. Cook for a further hour. When the ribs are done, use a spoon to skim off as much of the oil as you can. The gravy is fabulous just like this, or you can add a bit more water or wine to thin it. I added just a little water and stirred it around. Serve this short rib Bourguignon with something capable of soaking up some of that lovely gravy. I highly recommend a mash of mixed root vegetables, yams, potatoes and parsnips. Or perhaps just a green vegetable and a crusty loaf of bread. Do you need more “five ingredients or less” recipes to simplify your time in the kitchen? Look no farther than this list of wonderful links!